I have been selected as one of ten Ambassadors for the 2014 ZOOMA Florida Half Marathon & 5K! I am so excited and so honored to be a part of this great event, and I’m incredibly proud to be sporting the above badge on my sidebar. The 2014 ZOOMA Florida event will be held on January 18 at the Ritz-Carlton on Amelia Island. It’s a spectacular location, quiet and secluded, full of small town charm and natural beauty. I really can’t think of a better place for a race weekend away. Participants can choose to run a 5K or a half marathon, and then spend the rest of the day enjoying an oceanfront after-party, live music, post-race massages, shopping and recovery yoga. Not only will it be an awesome race weekend for local athletes, it will make for a great girls’ weekend for those traveling from farther away. 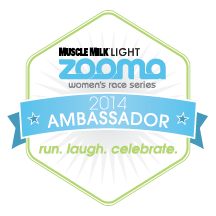 While ZOOMA is a women’s race series, dedicated to the empowerment of women (in fact, the series was listed as one of FitSugar’s top races to run with the girls), males and females are welcome to run and enjoy. What comes with your registration fee? I am ecstatic to have this half marathon on my race calendar and I hope you’re as excited as I am! Are you ready to register for a weekend of racing and relaxation? Insert the code FLAAMB3 at the end of the form to get 10% off your ZOOMA Florida race! Have you ever run this, or any other ZOOMA race, in the past? Will you be at Amelia Island on January 18? 46 Responses to i’d like to share some awesome news! Thank you, Patty! I’ve been beaming since I got the news! Awesome!! Congrats on becoming a Zooma ambassador! runswithpugs recently posted…i’d like to share some awesome news! Congratulations, Jen! That sounds like a great opportunity for you, and an amazing race for anyone to participate in! What a location!! I know! The Amelia Island/Fernandina areas are incredible and really, the perfect way to showcase NE Florida. Mr PugRunner and I have also stayed at that particular Ritz-Carlton before for a date weekend and it’s nothing short of fabulous. Thank you, Kristen! I am so excited! Congratulations! I am so excited – there is such a great time and I am looking so forward to getting to know all the ambassadors better! I’m counting on you for countdowns, too! Kristin @ A Mom on the Run recently posted…Run Zooma? Yes, Please! Me either! There are some amazing women and athletes on the team! This sounds like SO much fun! I wish I lived there so I could run this! I am pretty giddy about it! I wish you lived here, too. There are ZOOMA races in a few other cities, though. Maybe there will be one closer to home for you? Awesome! Congrats…that looks like a great event! Shannon recently posted…Huge Online Raffle! I can’t wait! There are so many fun events surrounding the races, and the course is going to be so lovely. I wish you were closer, too! WooHoo! Congrats. So happy for you. Wish I could do it! Thank you! It will be much warmer down here than up there, that’s for sure! Congratulations, Jenn! This is so exciting! Maybe I’ll look into running it 😉 Sounds fabulous! Oh, you should! You’re not that far away! Bring some friends and make a weekend of it! Cori @ olivetorun recently posted…How Do You Do What You Do? That is awesome news!! Congrats!!! I’ve heard of this race, but I haven’t done it. I look forward to hearing how it goes for you, I bet you have a blast!! Ahhhhh congratulations, that is too neat! If I still lived in FL I would be at that race in a heartbeat! They always look so, so cool when I read other bloggers recaps. Maybe one day! Anne @ CandyCrazedrun.wordpress.com recently posted…I like to Move It Move It! I wish you could, too! You are always so sweet and so supportive. I hope we are able to connect at a race one day! seriously. this race is a blast. can’t wait to see you there! From the race reports I’ve read, it sounds like it! So excited to meet you, Presley! *while doing a happy dance* Jenn that’s ah-mazing! Woohoo. Internet High Five! I’m excited for you. I did a happy dance too!!! Thank you! Woooop Wooop!! That’s so awesome!!! I’ve never run a ZOOMA race! But heyyy this race is in florida anddd you get wine…. just might have to register 🙂 Congrats to you! Presh @ The Coily Bombshell recently posted…I have a thing for Spicy Blackbean Burgers! Florida and wine are selling points for me! I hope you decide to come up for it! This is so exciting! Congrats Jenn! Really awesome 🙂 Sending you giant hugs!! Congrats! I hope to run a Zooma race one day. They look so fun! Thank you! I hope you get to run one soon! Thank you! I’m so excited! Clicking over now! Cool! We have a Zooma race in Maryland over in Annapolis, I should check it out next year. Oh, you should! I bet you will have a blast! This is so exciting- how did you apply to be an ambassador? That is something I’d be super interested in for maybe 2015. If I can get a free race reg. and promote my favorite thing- running- that is SUCH a win! Some of the big and/or specialty races announce an application process several months to a year prior. If there’s a race you love, maybe try emailing the organizer and seeing if they have an ambassador program or would be interested in starting one. You could get in on the ground floor!